Are we tired of talking about e-scooters yet? That Bird or Lime e-scooter you rode — or maybe dodged? That was a Segway. Never mind falling off, Lime is pulling some of their e-scooters from Los Angeles, San Diego and Lake Tahoe because the batteries could catch fire. Speaking of Lime, the company will be offering free e-scooters and dockless bikeshare rentals on Election Day next week. Thanks to Baz for the link. And you can Bike the Vote with Metro, as Metro Bike will join bikeshare operators around the US in offering free rides on Tuesday, as well as free bus and train rides. Meanwhile, Metro Bike is offering a chance to win a free $200 gift card for participating in their annual survey. Sometimes there aren’t any good guys. After a video went viral showing a driver sideswipe an Aussie bicyclist, then get out of his car and toss his bike into the bushes, both men ended up in front of a judge. The guy on the bike got probation and a letter of apology after admitting he keyed the driver’s car before the crash shown in the video. Not to mention doxing him by posting his name, address and phone number online. The driver, who was already on probation, had four other charges dismissed after copping a plea to recklessly causing injury, and got off with a $1,000 fine and court costs. Still unanswered is what the hell the driver did to piss the bicyclist off in the first place. Because people on bikes hardly ever just key cars at random. Just weeks after writing about the dangers of biking in Los Angeles, and on Spring Street in particular, KPCC and LAist journalist Leo Duran nearly got hit by a red light running driver while attempting to cross on the new bike signal. Los Angeles plans to use eminent domain to acquire the land needed for a pedestrian bridge over the LA River connecting Cypress Park and Frogtown after reaching an impasse with a developer who wants to build on the land, even though it’s in the flood plain. 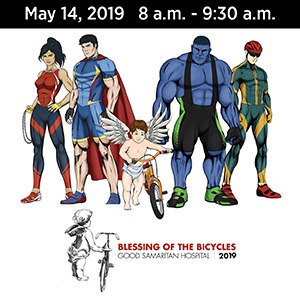 Another bike event is scheduled for this weekend, as CICLE and Metro are hosting a BEST Ride to tour Scott Froschaur’s The Word on the Street public art project. A police website profiles Pasadena’s newly reformed Neighborhood Action Team bike cop unit; officers weren’t required to know how to ride a bike when they joined, but had to learn how to fall. The CHP is asking for donations of bike lights and reflective gear to distribute to people in Modesto who can’t afford to get their own. Although it would be nice if they didn’t blame bicyclists and pedestrians for causing most crashes. Formerly Scotts Valley-based Fox Factory will say hasta la vista to California by moving their HQ to Georgia, and transferring the bike products division to Reno. Good story from a Redwood City high school newspaper about the city’s new protected bike lane, and how it could encourage more people to ride. Seriously, someone should tell the kid who wrote it that he’s got a great future in the news business. A Bay Area man describes the day his heart short-circuited while he was riding, pedaling up to the ER with his pulse pounding at 215 beats a minute. Meanwhile, VeloNews examines the effect endurance sports has on your heart. Outside considers those vital beer and candy pairings for your leftover Halloween treats. Bike Snob wants to make the roads safer by making driving dangerous again. Bicycling offers five recovery tips. This is who we share the roads with. A Portland driver was taken into custody for purposely driving into protesters outside the county courthouse. This is who we share the roads with, part 2. A pair of Portland business owners apparently think it’s okay to run over people with their cars. Or maybe funny, which is worse. Tacoma WA is finishing the final link on a 15-mile bike path that will give riders a safe crosstown route for the first time. Which is exactly what we need in Los Angeles. And for which there are no current plans. A writer for a Texas A&M university paper describes a series of wildcat Midnight Crits in San Antonio, saying it’s only for the daring. Dallas will open up 20 miles of streets on Saturday for their second annual open streets event. They get it. The prestigious Mayo Clinic is installing 200 bike racks around Rochester, Minnesota in an effort to get more people riding. Tragic news from Indiana, where a nine-year old girl and her six-year old brothers were killed when a pickup driver ignored the stop sign and warning lights on the bus, and slammed into them as they crossed the street; the girl had stepped in front of her brothers in a vain effort to protect them. The 24-year old woman behind the wheel now faces three counts of negligent homicide. Seriously, this is why drivers are supposed to stop for a school bus, but often don’t. And yes, bike riders are supposed to stop, too. Baltimore’s new Complete Streets ordinance is attempting to build racial equity into the law. Forget the Consumer Product Safety Commission’s tests on bike helmets. If you really want to know if a helmet will protect you in a crash, look to studies from the Virginia Tech Helmet Lab, which go far beyond CPSC standards to see how they hold up under tests that simulate real world conditions. Clean Technica blames physics for the rising rate of injuries and fatalities involving ebikes — but fails to take their increasing popularity into account. Never mind that they fail to differentiate between high speed throttle-controlled bikes, and the more common — and significantly slower — ped-assist bikes. This is who we share the roads with, part three. Prosecutors argued that an Ottawa driver was at best “willfully unaware” that he hit and killed a bike rider after driving home from his brother’s wedding at 4:30 am, and having been awake for 22 hours. Thanks to Stephen Katz for the heads-up. Caught on video: A Kiwi bike rider is lucky to avoid a crash as a delivery driver swerves directly into her. Australia’s largest bike advocacy group is calling for a repeal of the country’s law requiring bike helmets, at least for riders on sidewalks and offroad paths. An Olympic track cyclist decides to ride the Leadville 100 after retiring, and discovers that nothing had prepared him for what he faced. Lance rides again, taking part in a Costa Rican mountain bike race despite a lifetime cycling ban; the race is held outside of UCI and WADA jurisdiction, which allows him to compete. The newly crowned women’s masters track cycling champ defends her victory, saying it’s okay for trans women to compete — and win — in women’s sports. A man writing as a woman offers advice on how she’s more comfortable riding men’s bikes instead of women’s, which makes sense since she evidently isn’t one. Zwift goes virtually cycling in a virtually scary Halloween world. And Taipei’s mayor is one of us, and he raps. Once again, bikeshare was the common theme in today’s news. LA officials debate proposed regulations for dockless bikeshare programs that allow them to expand beyond a handful of test programs currently underway. The San Diego Reader reports that dockless bikeshare companies are pouring money into the city to lobby for favorable regulations. Coronado took a pass on a pilot dockless bikeshare program after residents argued that the community already has too many bikes. But sure, just keep bringing in more cars. Video shows New Yorkers swarming a bikeshare station while cars sit parked idly at the curb, suggesting that the 150,000 acres of curbside parking in the city could be put to better use. Ninety-two San Diego third graders go crazy when they’re given new bicycles by the Padres, the last remaining major league sports team in the city that hasn’t yet bolted for Los Angeles. San Diego’s Metropolitan Transit System gave new bikes to 100 elementary students in the Logan Heights neighborhood. A pair of San Diego-area organizations gave new bicycles to all 187 second and third graders at a Spring Valley elementary schools. Corona firefighters are taking time between emergency calls to build 72 bicycles donated by a local businessman for disadvantaged kids. Over 100 Georgia students will receive new bicycles donated for needy families. 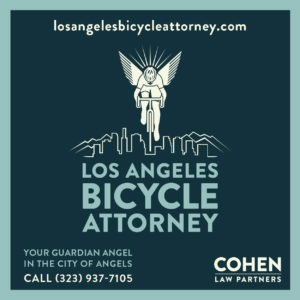 It’s Day 21 of the 3rd Annual BikinginLA Holiday Fund Drive. Thanks to Mike W and Plurabelle Books for their generous contributions to help keep bringing the best bike news and advocacy to your screen every morning, from around the corner and around the world. A new pop-up museum in DTLA celebrates notable failures, from the Edsel and a Donald Trump board game to a plastic bicycle that melted on hot days. CiclaValley looks at this weekend’s holiday ride sponsored by the LACBC and Bike Walk Glendale. Bicycle Retailer looks at LA-based Team Dream Team and their new San Marino Cub House. Bike Talk chats with custom bike maker Art Ramirez. 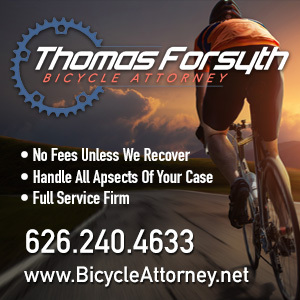 A Fallbrook man was seriously injured when his bike was rear-ended by a hit-and-run driver; police are looking for a charcoal grey vehicle with damage to the right front. Best euphemism of the day: the driver “failed to safely maneuver” around the victim’s bike, which is another way of saying the cowardly jerk plowed into him from behind. Take a 10-mile bike tour of life-like metal sculptures representing the Pleistocene age in Borrego Springs. Indio will add a pair of bike lanes this spring, including a separated bike lane. Ventura County sheriff’s deputies are asking for the public’s help in identifying a Camarillo bike thief. A Fresno man took revenge on a suspected early morning car burglar by cutting his bike in half and nailing it to a tree. Although it’s entirely possible that the bike he cut in half may have been stolen from someone else. Yes, you can take your Christmas tree home by bike, as these photos of Bay Area bike riders prove. Or a Chanukah bush, for that matter. A San Raphael man was busted for stealing a cheap guitar after smashing a music store window, when police spotted him riding a bicycle carrying the purloined instrument a few hours later. Treehugger says it’s time to start thinking about driving like we do smoking. Bicyclists in Tucson are angry over the city’s ranking as the second most dangerous city for people on bikes in the US. Meanwhile, no one really seems to care that LA was ranked as the tenth most dangerous city. A Minneapolis columnist is angry over an LA letter writer’s suggestion that the city shouldn’t go backwards on bike lanes, saying maybe we should put bike lanes on Sepulveda Blvd so we can understand what it’s like. Maybe someone should tell her that we already have bike lanes on Sepulveda, crappy though they may be in places. Turns out the New York state senator who attempted to impersonate a police officer after illegally blocking a bike lane has a long history of dangerous driving, including speeding through a school zone — three times. Philadelphia is responding to a recent cycling death by upgrading six blocks of bike lanes in the downtown area. Although I have a hard time calling a few plastic posts a protected bike lane. An Instagram account documents a man’s unique collection of classic stamped, forged and cast steel dropouts. Caught on video: A Vancouver cab company apologizes after one of its drivers was caught on dashcam driving in a bike lane before running a red light with people in the crosswalk. The human-protected bike lane movement has spread to London. Bloomberg visits the UK’s Sven Cycles to discover what goes into making a handmade bespoke bike. A British driver was acquitted of killing a bike rider after saying he just didn’t see her. Which should be seen as an admission of guilt instead of an alibi. An Australian radio station asks how the country can change drivers’ open hostility towards people on bicycles. Easy. Just make them all ride bikes for a month. Five people were killed in China when ebike batteries caught fire after being plugged into a homemade recharging system. A Bangkok writer explores one of the few places where people can ride their bikes free from motor vehicles or joggers, thanks to monks who agreed to abandon the land after moving to a new temple. Does it really surprise anyone to learn that four-time Tour de France winner Chris Froome failed a drug test at last year’s Vuelta? Froome had a controversial Therapeutic Use Exemption, or TUE, for salbutamol to treat his asthma, but tested at twice the allowed level. Which he quickly explained away. Just like everyone else who’s gotten caught. Once again, throwing a bicycle in front of a train is not a recommended usage. If you’re going to get drunk and ride your bike on the wrong side of the road, at least put a damn light on it. And always keep a bell on your bike in case you’re ever attacked by a Bengal tiger. We’ve got a long list of bike events this month. So grab a cup of whatever you’re drinking, and settle in for awhile. The Abbot Kinney outpost of Bay Area bag maker Timbuk2 is hosting a Break Up With Your Bag food drive next weekend. Timbuk2, the San Francisco-based creator of intuitive, stylish and personalized bags to outsmart the city, is hosting a two-day Break Up With Your Bag event from Saturday, December 9 to Sunday, December 10. Stop by the Venice shop for a chance to give back to the local community and gain something special in return. Have some extra food or an unused bag lying around? Timbuk2 encourages their neighbors to donate to someone in need for something they can use in exchange. First, bring in any non-perishable food item OR any gently used bag, no matter the brand, that’s ready to bid adieu. Next, Timbuk2 will donate every used bag to Bikerowave, and every non-perishable food item to the Los Angeles Regional Food Bank. At last, Timbuk2 will hook it up with a new item for 40% off! To enhance this rewarding experience, Timbuk2 will provide tasty snacks and refreshing libations from Fort Point Beer. So mark those calendars and grab a bud, because breaking up feels good when it means giving back. Bike SGV invites you to join them in tonight’s La Puente Holiday Parade. Heal the Bay is hosting an Explore Ballona! Bike Ballona Creek ride this Saturday. I. Martin is holding their “Shut Up Legs” Saturday morning ride, while Helen’s Cycles is hosting a Monthly Group Ride tomorrow, and a TriFit Beginner’s Ride on Sunday. Bike SGV celebrates the season with their annual holiday awards fest Noche de las Luminarias Saturday afternoon. Join Bike Oven in the NELA Holiday Parade this Sunday. Also on Sunday, the LACBC teams with AARP for the December edition of their popular monthly Sunday Funday Ride, offering a tour of Griffith Park. And no, you don’t have to be over 50 to participate. Bike SGV is celebrating the Monrovia Holiday Parade on Bicycles December 7th. 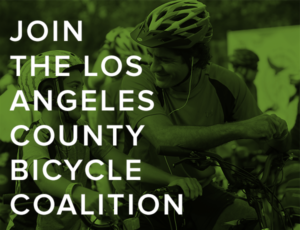 Also on the 7th, the LACBC is holding their annual Open House. Santa Monica Spoke is hosting an Ugly Sweater Holiday Ride with the Mayor of Santa Monica on December 9th. Also on the 9th, the LACBC is teaming with former pro Phil Gaimon, author of the new Draft Animals, for the 3rd Annual Clean UP Mulholland. CicLAvia returns to iconic Wilshire Blvd on December 10th. The very busy Bike SGV is holding a Cycling Santas Holiday Lights Ride on the 16th. The 12th edition of LA’s iconic Feel My Legs, I’m A Racer hill climb competition rolls December 17th. Also on the 17th, Walk Bike Glendale and the equally busy LACBC are hosting a Holiday Bike Ride. Today’s common theme is dockless bikeshare — and dockless bikeshare problems — around the world. A new semi-dockless bikeshare system from Zagster promises to overcome the problem of abandoned bikes by offering a system that can be locked to their docks or any bike rack. Although that could mean bikeshare bikes hogging limited bike parking. Dockless bikeshare is raising safety concerns in Dallas as abandoned bikes litter a popular tiding trail, even as a fifth bikeshare provider prepares to come to town. A writer for Bicycling offers thoughts after riding dockless bikeshare around DC for a week. A bike industry website says the uncontrolled spread of dockless bikeshare is not what European cities want. Sydney, Australia’s government councils have given dockless bikeshare operators three months to clean up their act. Another common theme is adaptive bicycles. And the kindhearted people who help keep their owners riding. It takes a real schmuck to steal an adaptive bike from a Danville school; fortunately, police were able to recover it. Friends are crowdfunding a new adaptive tricycle for an Iowa woman with cerebral palsy, after someone stole the one she used to ride to work. Ohio firefighters buy a new adaptive bicycle for a 12-year old girl with cerebral palsy after she called asking for help finding one. After someone stole a three-wheeled bike a man with Down’s syndrome used to ride to his job at a Cleveland restaurant, his boss quickly ordered a new one for him. This is day eight of the 3rd Annual BikinginLA Holiday Fund Drive. Any donation, in any amount, is truly and deeply appreciated to help keep SoCal’s freshest bike news coming your way every day. And thanks to Chris K and Megan L for their generous donations to help support this site. A very polite editorial in UCLA’s Daily Bruin calls on Councilmember Paul Koretz to provide desperately needed bike lanes in Westwood Village. Maybe they’ve forgotten Koretz’ promise to business owners in the Village that he’d never allow bike lanes on Westwood Blvd in the Village. LA plans to complete two LA River bike path projects by 2025 as part of their Twenty-Eight by ’28 list to complete before the coming 2028 Olympic Games. CiclaValley recognizes the bad driver of the month. Santa Clarita opens a new trailhead leading to the Santa Clara River Trail, complete with bike racks and a repair stand. Los Angeles reaches a settlement with El Segundo that will allow planned improvements to go forward at LAX, including a consolidated rental car center and improved bicycle and pedestrian access. Now you can rent ebikes in Long Beach’s Shoreline Village. San Diego County agrees to a $77,500 settlement in the death of an unarmed man as he was working on his bicycle in his parent’s garage. San Bernardino authorities have filed a murder charge against 34-year old Dominic Simmons in the death of Elroy Preston last Sunday; Simmons allegedly ran down Preston as he rode his bike after the two had been in the same home together. San Francisco police hold a fundraiser for a bike cop who was severely injured when he was run down by a driver in October. No irony here. After an Oakland cop refuses to ticket a driver parked in a bike lane because he has better things to do, a Streetsblog writer see his patrol SUV in the parking lot, with a police bicycle on the back. Lake County’s Bike Angels are planning a bicycle giveaway next month for anyone who survived October’s Sulphur Fire. Seriously, always look both ways before you cross the street, unlike this Chico rider. Momentum looks at why North American cities rarely rank among the world’s best bike cities, and what we can do about it. Ohio police are looking for a bank robber who made his getaway by mountain bike. A Cambridge, Massachusetts bike rider calls on the city to suspend new bike lanes for the winter, saying they make traffic worse by putting bike riders in the middle of the lane, slowing traffic. Which makes it sound like he doesn’t know the difference between a bike lane and sharrows. A Brooklyn bike shop owner wants you to visit your local bike shop December 9th for the first Bike Shop Day. Philadelphia cyclists demand safer bike lanes now, after a woman was killed by a garbage truck while riding in a bike lane. A Georgia woman won’t be behind the wheel again for a very long time, after she was sentenced to 25 years behind bars for killing one bike rider and injuring another after plowing into a group of riders while driving distracted with methadone and other drugs in her system, and her two-year old daughter in the car with her; she was still driving despite two previous DUI arrests. Yet another example of keeping a dangerous driver on the road until it’s too late. Heartbreaking story from Florida, as a woman survived Hurricane Irma in a dramatic rescue, and fell in love with her rescuer, only to die at the hands of a hit-and-run driver as she was riding her bike. The UK’s Cyclist Magazine writes in praise of the bicycle. A British advocacy group calls on Britain not to miss a huge opportunity to change the country’s future by expanding safe bicycling networks, as 37% of say they aren’t willing to let their kids ride to school. An Irish writer calls for an end to hate speech directed towards bicyclists, which is banned when directed towards other groups. The 1st Amendment means a prohibition like that would be illegal in the US. A French company launches what they consider the world’s safest bicycle, complete with electronic anti-lock brakes, automatic emergency braking, and a 360-degree warning system. Full body bubble wrap is optional. A European website recounts the biggest scandals in pro cycling over the past year. Of which there were many, evidently. The Giro d’Italia won’t start next year’s race in West Jerusalem after all, after Israeli officials threaten to cancel the race because there is no east or west Jerusalem as far as they’re concerned. But the only thing that actually changed was the wording on the website. How a NASCAR racer overcomes his fear of spandex. You may not be able to make it up the world’s great climbs, but now you can down your coffee from them. And if you don’t like your commute, just paint your own road signs. Thanks to the aforementioned Megan Lynch for that last link.